Are credit cards designed to keep you in debt? Today we're going to talk about credit cards. I state that with some trepidation because I know that a lot of people are going to disagree with me. That's fine. More specifically I want to talk about credit cards and how the cycle is made to keep you dependent on them. It's a multi-billion dollar industry that has Americans on the hook. Let's talk about how. While there are people, obviously, who are paying off their credit cards every month, that statistic shows us that the average person is not. Now, for years, we were taught to have a credit card in case there is an emergency. You need one in case there's an emergency, right? Wrong. Emergencies are hard enough without having to pay interest on them. Emergencies bring enough drama without the interest. An emergency should not cost you 16% interest and upwards. You need an emergency fund that is cash in the bank that you can get out and use when there is an emergency. My family has had a lot of emergencies this year. And I am so grateful for that emergency fund that we have in the bank. I can't imagine dealing with what we've dealt with and then dealing with 15%, 16%, 20% interest on top of that. You've taken an emergency, and you've compounded it into something that you have to drive around with you for months or even years to come. It's hard to heal from a traumatic event when you're still paying money on it. The next issue that we often run into is instant gratification with delayed consequences. When you shop, did you know that your brain gets a hit of dopamine? I'm not kidding; there is science. When you go to Target and you buy something, or Old Navy, or you get a package from Amazon, or wherever it is you like to shop, and you open it, you get a hit of dopamine. Which means that, if you are using a credit card to pay for that, you get instant gratification with delayed consequences. So if you're swiping a credit card every single time you go shopping, you feel good in the moment, but you don't feel good when that credit card statement arrives and you have to pay it off. I know I hear a lot from people who say, "The rewards are so great." Understand that getting cash back is wonderful. Are you saving that cash or are you buying more stuff with it? Because I feel like the last thing that Americans need is more stuff, right? And I know that there are also lots of debit card rewards programs. We have a debit card that gives us SkyMiles. You can google that; the information is out there. Google "debit card reward programs" and you will find them. There are a ton of them. 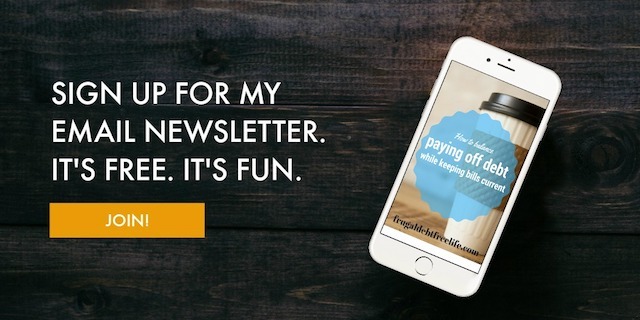 So you're not having to pay interest on something to get the rewards; you're just making the purchase just like you would make everyday, that you've budgeted for, that are coming straight out of your checking account. Finally, you are paying for the past when you are putting your life on credit cards. And then, even if you're paying it off at the end of the month, you're paying for things that have already happened, that's over. We want to look to the future. We want to move forward. We want our money to reflect where we want to go, not where we've been, right? In my opinion, your budget should reflect your goals and not your past purchases. It should be about moving forward and making positive steps — and not paying off things that you've already had in your home for 30 days.